Digging through another box of books from a retired academic I came across more Velikovsky material (adding to my copy of Worlds in Collision I received from him). I am now convinced this particular academic—trained as a physicist but employed in a history department teaching the relationship between science and religion—endorsed Velikovsky’s theory. This latest cache of material dates from the early 1970s when counter culture student groups around the country were taking up Velikovsky’s work (on the relationship between Velikovsky and the counter culture, see the last chapter is Michael Gordin’s The Pseudoscience Wars , where he talks about the journal Pensée ). Cosmos and Culture tested Velikovsky’s predictions and found empirical support for them. In July 1971 the Texas chapter of Cosmos and Chronos circulated a list of Velikovsky’s specific predictions that seemed to have been confirmed by the recent moon landing. “Lunar Probes and Velikovsky’s Advanced Claims” seems to reflect exactly what Steven Shapin was pointing out in his review of The Pseudoscience Wars . Shapin noted that proponents of any given pseudoscience try to make their claims seem especially scientific. In this case, they celebrated a basic falsification model—as with any good science, the validity of Velikovsky’s theory was grounded in the empirical accuracy of Velikovsky’s various specific predictions. According to Cosmos and Chronos, at least eight of Velikovsky’s predictions in Worlds in Collision and in various letters, lectures, and articles from 1967 through 1969 had all been confirmed. Their pamphlet listed Velikovsky’s predictions and marshaled evidence taken to confirm these predictions. In their hands Velikovsky looks like the most scientific of scientist, making specific, falsifiable claims years before observation proved him correct. 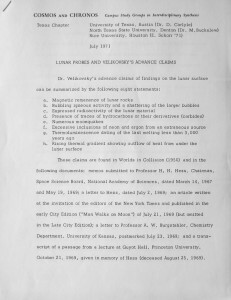 The following summer, Lewis and Clark College in Portland, OR, hosted an Immanuel Velikovsky Symposium, complete with keynote lectures by Velikovsky, “original papers by scholars from the fields of astronomy and earth sciences; archeology and history; and psychology, religion and sociology” and a “high level representative from NASA.” Organizers hoped “to speed, possibly by years, the full, scholarly evaluation of Dr. Velikovsky’s work” and “to inject new life into the NASA,” among other goals. For a mere $40, participants enjoyed this scholarly symposium and had the chance to interact directly with Dr. Velikovsky. 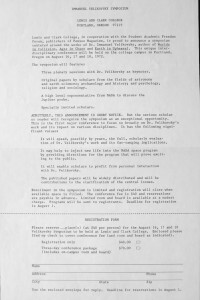 Invitation to the Velikovsky symposium at Lewis and Clark College in August 1972. In May of 1972 the journal Pensée had published the first in its 10-issue series, “Immanuel Velikovsky Reconsidered” (again, see the last chapter in Michael Gordin’s The Pseudoscience Wars for more on Pensée ). Pensée was another counter culture magazine out of Lewis and Clark College in Portland. It appears to have been a forum for members of the Student Academic Freedom Forum and the two brothers, David and Stephen Talbott, all of whom were Velikovskians. Velikovsky wrote essays for each issue and typically he responded to letters and questions from readers. Other sympathetic scholars wrote essays assessing different aspects of Velikovsky’s theory. 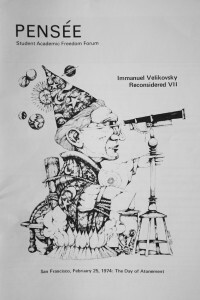 I quite like this parody of Velikovsky looking through a telescope. Robert Byrd’s illustration first appeared in 1968 on the Philadelphia Magazine . Velikovsky’s theory obviously had broad and idiosyncratic appeal. All this paraphernalia I have inherited came from the working, scholarly library of a rather traditional and conservative—socially, politically, and intellectually conservative—academic who had been trained as a physicist. Judging from notes and other bits in his library, he did not suffer pseudoscience or fringe science gladly. Yet here is all this Velikovsky material, arranged, cataloged, and carefully read and digested. Elaborate underlining in various colors and marginal notes attest to the effort he put into assimilating this literature. Perhaps his endorsement of, or refutation of, Velikovsky’s catastrophism is waiting in the unopened box on my office floor.